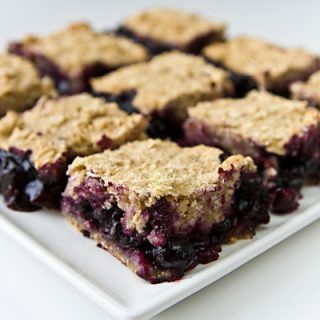 These delicious Blueberry Oat Bars are full of the flavor of fresh blueberries but contain no refined flour, oil, or white sugar. Sometimes I really miss living in the country. When I was growing up, acquiring fresh blueberries was just a matter of walking outside and picking them from one of the bushes in our yard. Getting my blueberry fix these days takes a little more effort. For the past few summers, E and I have visited a local U-pick blueberry farm where we’d spend an hour or so in the sun and come home with a couple of gallons of blueberries, some to be eaten immediately and most to be frozen for later. Well, this year “our” U-pick farm has gone out of business, and we haven’t succeeded in finding another. So we’ve had to make do with the next best thing: organically grown blueberries from the local natural foods store. When I saw them there a few days ago, I just had to pick up a pint; even though the cost was several times what I’d pay to pick my own, blueberries are such a part of summer to me that I couldn’t pass them up. Besides, I really needed them to make these bars, which I’d been craving for a few weeks. You won’t believe how healthy they are: no refined flour, no white sugar, no added fat, no soy, and no gluten*. They’re not super-sweet, but they’re full of fresh fruity taste. 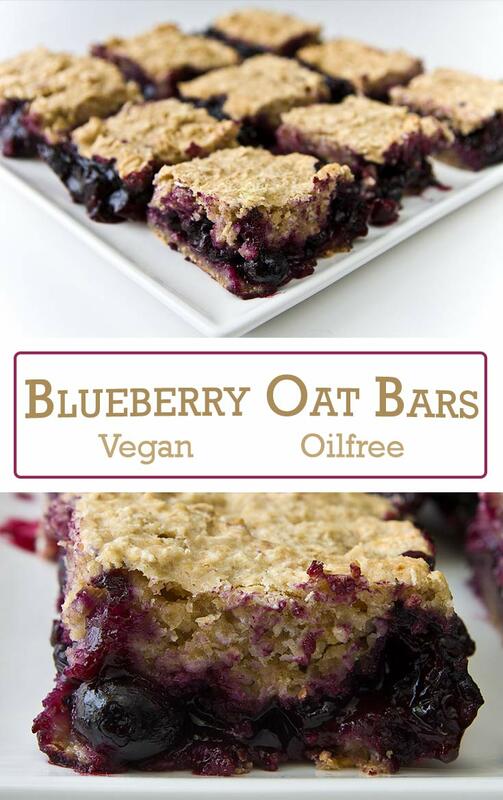 If you prefer a sweeter bar, add more agave nectar, sugar, stevia, or your favorite sweetener to the blueberries as they are cooking. Or add a sugar glaze on top by mixing a little vegan powdered sugar with water until it’s the right consistency for drizzling. Preheat oven to 375F. 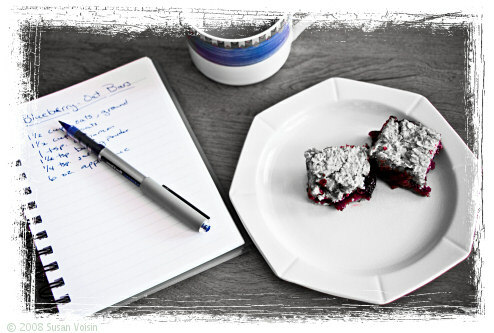 Oil an 8×8-inch baking dish or line it with parchment paper. In a small saucepan, combine the blueberries, 1/4 cup agave nectar, and juice. Bring to a boil over medium-high heat. When it boils, stir in the vanilla and the cornstarch mixture. Continue to stir as the mixture boils and thickens. Remove from heat and set aside. Put 1 1/2 cups of the oatmeal into a blender and grind it to a fine powder. Pour it into a medium-sized mixing bowl and add the remaining oatmeal, cinnamon, baking powder, and salt. Mix well. Stir in the apple sauce, remaining agave nectar, water, and vanilla, and mix well. 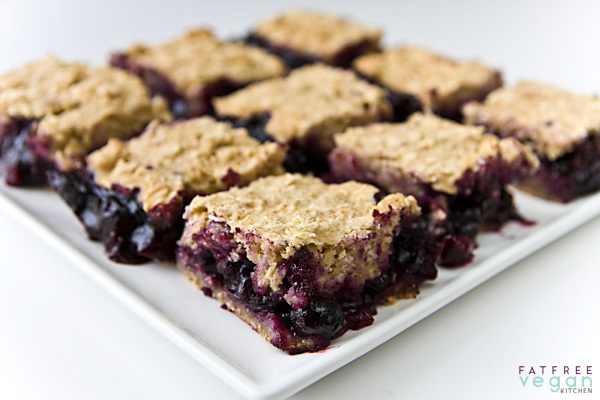 *Use gluten-free oats to make these gluten-free. Step 2 is just good on it’s own too, it makes great Jam!!! I assume you put the glaze on after it has cooled. Is there a substitute for apple juice? Or can I just leave it out? I’m bringing it to my vegan potluck I co-host once a month in Lansing, Mich. Right, wait until they are completely cooled or the glaze will slide right off. Instead of apple juice, you could just use water. I need to make a large quantity of these for next weeks school camp. Do you know if they freeze well? They should freeze without problems. Fabulous recipe! I have several Gluten free cooking friends that I am always looking to prepare new recipes for. They will LOVE these! Thank you for sharing!